fans. Photo by Christopher See, find more at christopher-see.photoshelter. Beaver, Utah, July 11, 2015 – In the small southwestern Utah town of Beaver, a town originally settled by Mormon pioneers in 1856 just west of the Tushar mountains, also known as the birthplace of both the notorious outlaw Butch Cassidy and inventor of the television Philo T. Farnsworth, a beautifully crisp and cool morning greeted the field the roughly 600 riders choosing to brave the course designed by former road professional Burke Swindlehurst in the Fifth Annual Beaver County Travel Council Crusher in the Tushar, presented by DNA Cycling. In attendance were riders from 23 US states and 3 countries, on a wide variety of bikes, ranging from cyclocross bikes to both rigid and full-suspension mountain bikes, geared and singlespeed, with flat bars, drop bars, riser bars or moustache-bars, and even a couple of tandems, ready to tackle an event that never dipped below 5900’ in elevation. The 69-mile course through the remote wilderness areas of Utah’s little-known Tushar Mountains and Fishlake National Forest features a near-perfect 50/50 split of paved and dirt roads spanning two counties and approximately 10,000 vertical feet of climbing, before finishing at Eagle Point Ski Resort, with a summit just under 10,400’. Men's Open winner and KOM Rob Squire (Hincapie Devo) leads Jamey Driscoll (Raleigh Clement) out of Sarlac. Photo by Christopher See, find more at christopher-see.photoshelter. Amongst the Pro/Open Men starters was 2014 runner-up Jamey Driscoll (Raleigh-Clément), who had shown a steady progression in his three prior participations, finishing 7th in 2012, 4th in 2013, before finishing 2nd to Levi Leipheimer in 2014. Toeing the line alongside Driscoll were fellow New Englanders and pro cyclocross riders Jonathan Page (Fuji-Spy Optics) and Tim Johnson (Volkswagen-Cannondale), along with Sho-Air/Cannondale pro mountain biker Alex Grant (4th 2012, 6th 2013). Like Driscoll, Grant and Page now make their home in Utah. Also in the field were Team Sky professional Danny Pate, former professional road rider Neil Shirley (Road Bike Action), professional cyclocross rider Allen Krughoff (Noosa), and Salt Lake City native and professional road rider Robbie Squire (Hincapie Racing), along with 2011 podium finisher Benjamin Blaugrund (Juwi Solar), making his third appearance. After an easy roll-out, Blaugrund and LeRoy Popowski (Groove Subaru) decided to get the ball rolling by launching the early break, quickly opening up a gap of 5 minutes on the rest of the field. Soon after, Jake Wells (Form Attainment Studio) and Menso de Jong (Team Clif Bar) attempted to bridge the gap, but were never quite able to shut it down. Once the field hit the first dirt climb, the field started to come apart as one-by-one riders dropped off the back of the main chase, which was soon down to just 4 riders as Tim Johnson, Allen Krughoff, Neil Shirley and Jonathan Page were all initially left behind on by the pace set by Robbie Squire, Jamey Driscoll, Danny Pate and Alex Grant. As the riders neared the top of the first climb, Jonathan Page managed to reattach himself to the Squire and Driscoll group, and the group of 5 soon reeled in Wells and de Jong. With Utah rider Andrew Dorais (Contender Bicycles) also bridging the gap as the group approached Betenson Flat before the drop down the backside of the course, there was now an 8-strong group chasing the two leaders down the 5-mile unpaved descent of Utah Highway 153 towards the town of Junction. Not surprisingly, the descent of Utah 153 claimed a few casualties as both Alex Grant and Jonathan Page flatted rear tires on the descent. With the Crusher’s rules against outside mechanical assistance, both riders were left on the side of the road to repair their flats, damaging their hopes of a top-3 finish. Menso de Jong had a race-ending crash, tearing the rear derailleur from his bike; but suffered no major injuries. Surprisingly, considering the rough road conditions faced on the descent, Danny Pate was the fastest down the mountain despite only being able to fit 25mm road racing tires on his team-issue Pinarello Dogma. “The conditions were pretty good, the course was selective as always. Going down the descent was equally as selective, if not more so. Danny Pate was a machine out there, on road tires no less, impressing all of us,” said Driscoll after the race. As the remaining riders in the lead hit US Highway 89 on the stretch from Junction to Circleville, LeRoy Popowski, who was riding a mountain bike, was left behind by Blaugrund, who was on a cyclocross bike. As they entered Circleville, Blaugrund’s lead over Popowski was about 2:15, with the chase, now consisting of Squire, Driscoll, Pate, Dorais, and Wells a further 1:15 behind. The chase group caught Popowski as they turned onto Doc Springs Rd., also referred to as the infamous “Sarlacc Pit” due to its often soft, sandy surface and full exposure to the sun. On this day, however, the road caused gave the riders little trouble as recent rains made the surface relatively hard-packed and smooth, and there was just enough cloud cover to keep temperatures cool as the riders looped around to rejoin Hwy 153 for the ascent of the oft-feared and aptly named “Col d’Crush”. At this point Robbie Squire began applying a little more pressure and once again the group started to get whittled down as Dorais, Wells, and Pate were all gapped, with only Jamey Driscoll initially able to maintain contact. Working together, Driscoll and Squire finally managed to bring back Blaugrund as they made the left turn onto Hwy 153, but as the road turned upward, Squire started dancing his way up the climb, leaving first Blaugrund and then Driscoll behind, maintaining a steady but rapid pace to claim the KOM prize at 13 miles to go. 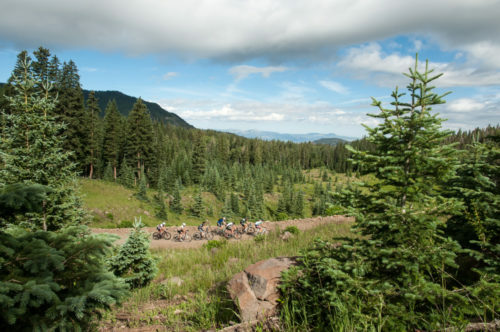 The pain didn’t stop there, however, as Squire and the rest of the riders still faced another 1,000 feet of climbing back to Betenson Flat before turning north towards Big Flat. For the final sting in the tail, Squire faced another 10% average climb over the last mile before crossing the finish line at Eagle Point Ski Resort in 4:09:59, setting the second fastest time since the race’s inception in 2010, just 3:42 slower than Levi Leipheimer’s record time of 4:06:17 set in 2013. “There was a bit of a tailwind up the Col d’Crush and so I was waiting for that to give it a little effort,” said Squire of the winning move. Driscoll managed to hold on for 2nd place, in 4:22:33, just over 12 ½ minutes behind Squire, while LeRoy Popowski managed to claw back time on the final climbs to finish 3rd at 4:24:41. “Robbie and I were together heading up the Col d’Crush, and he just took a look back and punched it. I tried to keep him in sight, but there was nothing I could do. I just fell apart and he had the legs and kept going all the way to the finish,” said Driscoll. “Everyone was blown away by Danny Pate on the descent. He saved a little something on the top little rollers, and just came flying by everybody on a road bike, with teeny-tiny little tires. Driscoll came by me, and exclaimed ‘Holy crap! What a boss!’” added Squire. Danny Pate also really enjoyed his first Crusher experience. “This was a fun race, and I was glad to be here. It’s a unique race, which is why I wanted to do it. It appealed to me because it had some road, some dirt, and a bit of everything and you just run what you brung and ride any bike you want,” he said after the race. Pate’s next appearance on the international stage will be at the Clásica San Sebastián, and then a likely spot on Team Sky’s roster for the Vuelta a España. Rounding out the top-10 were Alex Grant (4th), Jake Wells (5th), with Neil Shirley (6th) just edging out Danny Pate (7th) in a two-up charge for the line, followed by Benjamin Blaugrund (8th), Andrew Dorais (9th) and Tim Johnson (10th). Starting a minute after the Pro/Open Men, the Pro/Open Women was stacked with talent as well, featuring former US National Road Race Champion Robin Farina (realwheelsbike.com), multi-time Canadian National Champion Lyne Bessette, professional Enduro rider Kelli Emmett (Juliana-SRAM), and Utah riders Mindy McCutcheon (Canyon Bicycles-Shimano) and Anne Perry (DNA Cycling p/b K4 Racing). 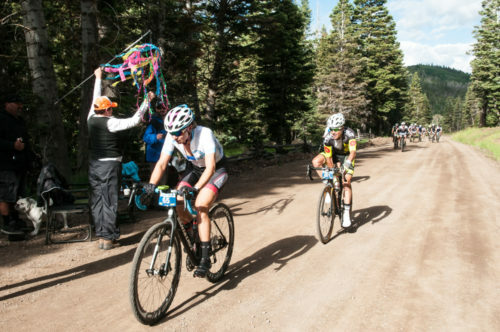 As the group approached the first climb, Mindy Caruso (Nero Veloce) launched the first attack, bringing Robin Farina and Mindy McCutcheon with her. The three riders drilled it up the climb to Betenson Flat, but Caruso was unable to hold Farina’s and McCutcheon’s wheel, and was gapped before topping the first climb. On the descent of 153, Farina plunged down the mountain, leaving McCutcheon and everyone else behind. Caruso was able to catch and pass the undergeared McCutcheon on the descent. Farina brought it home in 5:01:48, destroying Gretchen Reeves’ 2013 record pace of 5:16:46 by just shy of 15 minutes. Caruso’s late charge saw her narrow the gap to 1:36 as she finished in 2nd with a time 5:03:24. McCutcheon cruised across the line in 3rd place at 5:10:14, also breaking Gretchen Reeves 2013 record by a wide margin. Preston Yardley winner of the 19-21 class. He held on to Robin Farinas wheel most of the way back up the climb. One of the beautiful things about the Crusher is the loyalty that it inspires in its riders, many of whom have participated in each and every edition since the first in 2011. Like Paris-Roubaix, it is inspiring and it is frustrating. For many riders, just finishing is a victory and having to abandon, whether for physical, mental, or mechanical reasons can be devastating. One such rider is the 47-year old Thomas Cooke, of Park City, Utah, the 16th rider to cross the finish line at Eagle Point this year, who put in one of the most amazing rides of the race. Starting in the 45-49 age group this year, Cooke started in one of the last waves, 9 minutes after the Pro/Open Men’s field, and chased down and passed all but 15 riders in front of him, including every single age-group rider. On a strict timed basis, taking into account and adjusting for the later start, Cooke’s finish time of 4:38:51 set a record, not just in his own age group but for all age groups, and would have been good enough to put him in 10th place in the Pro/Open Men’s field, for the second year in a row, knocking 14:19 off his 2014 time. Adam Lisonbee of Highland, Utah is another 5-time finisher, who has experienced the highs and the lows that the Tushar Mountains can dish out to those who brave her roads. This year’s Crusher was Adam’s first race of the year, and he had doubts about his form, but as he as done every year, he lined up determined to give it his best until the course told him otherwise. As it turns out, Lisbonbee was on a good day, until he wasn’t. “Turns out, the legs felt great all day long. I set a new personal best climbing the Col d’Crush, and had set myself up for a course PR when I flatted with 5 or 6 miles to go. I opened up my pack to get a replacement tube, and the tubes I brought with me had valve stems that were too short,” he says after the race. First-timers like Amy Thornquist and Shane Dunleavy also recognize just how special the Crusher is, especially with regards to the volunteers and townspeople that live on and around the course. For Amy, this was not only her first Crusher but only her second-ever endurance race on dirt. Considering that Amy won her competitive 36-49 age group on her first attempt at the race, I feel certain that this is not the last time that she will be toeing the line in Beaver in July. Steve Wasmund is another 5-time Crusher rider. For Steve, the very first Crusher was another opportunity to do challenging ride to do on his singlespeed CX bike. Since that first ride, Steve has finished all 5 times he has entered, and his wife Amy has finished 4 times. The past two years, Steve and Amy have won the tandem category, which doubled in size this year. For this couple, the Crusher is like an annual reunion. That kind of loyalty isn’t limited to just the riders however; but also to sponsors, such as Utah’s own DNACYCLING. “As a cyclist I rode in the first Crusher, and it was one of the toughest races I have ever done. That first year, it was such an unknown, I just grabbed the bike and rode,” says Joe Sepulveda, co-founder of the company. Since that first year, DNA’s support of the race has grown, from the Crusher Bike Photo Booth, to adding another fully-stocked feed zone/aid station about halfway up the Col d’Crush. While all the feed zones and aid stations are well-supplied with bottles of water and hydration mix from First Endurance, as well as energy bars, fresh fruit and other tasty and nutritional fare, the DNACYCLING Feed Zone is also stocked with less traditional fare, like Pop-Tarts, ice-cold bottles of Mexi-Coke, Hostess Ding Dongs and similar fare, as well as a water sprayer to help cool riders down during high-heat years, like 2014. The sport of cycling has been going through a rough patch the past few years, with losses of sponsors due to both the economy and negative press at the upper echelons due to scandals around doping and accusations of corruption in its governing bodies. An hour and forty minutes in, the race is broken into small groups and single riders, few of whom have time to take in the views. Swindlehurst’s back-to-basics attitude with regards to equipment and outside mechanical support, combined with his commitment to provide the absolute best in rider support means that his race has quickly become one of the must-do bucket-list events, attracting large fields including both national and international stars from the upper-echelons of the sport. It is this type of mutual loyalty and commitment by riders, sponsors, and the promoter that will help restore the credibility of the sport. See results in this issue on page 14.